Silver Bay mare, 32 inch, born on February 26, 2007. S: Silver Plates Baccara Sampson. D: Lucky Four Black Velvet Juleybuck. 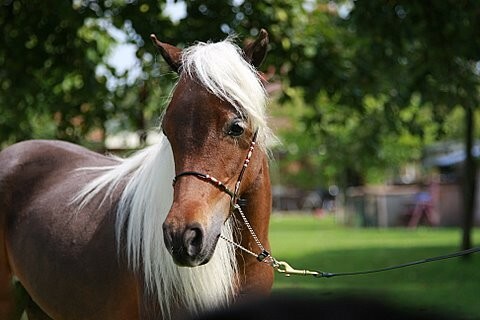 Fanci is the mother of our first miniature horse Tybee. When Tybee died and we got the chance to have Fanci with us, there was no doubt . Fanci has a beautiful appearance, long neck , big eyes, straight legs, straight back and gives wonderful foals such as Multiple Champion, European Champion and Multiple Grand Champion 1st premium , SSF Velvet Bucks Amazing Silver Moon ( by Libertymeres Velvet Buckeroo ) and reserve Grand Champion Junior Mares, SSF Beautiful Jeanny to Remember ( by Fallen Ash Scouts Red to Remember ) . But also important are the names in her pedigree including: Boones Little Buckeroo , Little Kings Buckeroo Baccara , Little Kings Black Velvet. Click here for the complete pedigree of Lucky Four Sucha Fancibuck.